Ever since I did the "Dr. Octopus" Raven Guard Techmarine conversion way back when, I've been fortunate that my Client has come back for more work and I've been able to keep working on my Raven Guard army that he plays for me. This time, I've got a bunch of character models that I'm converting into Raven Guard figures. What's that mean? Lots of shaving off Ultramarine symbols and sculpting new stuff in place of it. Add some resin bases and paint them up in the "correct" colors. I decided to start with Telion since I've done one of these models before for another friend of mine. I knew what I would be getting into with this one so I thought it would get my confidence up by starting with something I knew. The base comes from Dark Art Miniatures. 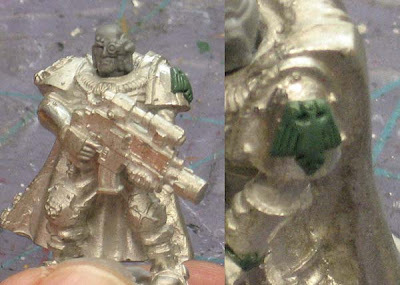 A quick head swap to get rid of the "iconic" Telion look and a resculpted shoulderpad were the two big changes. At first, I was just going to paint the symbol on his shoulder, but I decided to sculpt it at the last minute to give the shoulder some texture to match the other one he wears with the laurel and skull. I'm glad I did in the end, it adds that extra touch to the model. 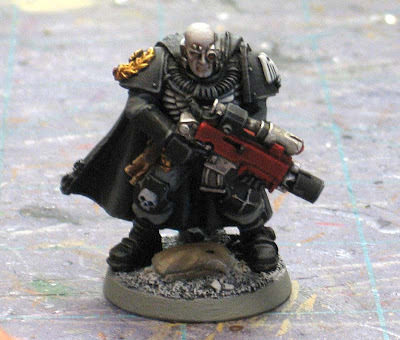 He's painted to match the Raven Guard Scout squad I did previously. Good thing I wrote down all my painting formulas. I added the gold on his shoulderpad and the bolter casing hanging from his belt to make him stand out from all the other Scouts. None of them are allowed to wear any gold. Next up: Pedro Cantor Raven Guard conversion. Looking good mate. really clean effect with the green stuff work. ive noticed your getting really good with green stuff sculpts. have you considered a scratch sculpt? Simple, clean conversion there and it really does have that sinister, gloomy Raven Guard feel. Will Cantor also be getting the Raven Guard treatment? First word that came to my mind was WOW!!! You've made him look like a veteran who has looked Chaos in the face and survived to tell the tale. I do have to ask though, what is the skin formula as its brilliant? Coming up with a pale skin paint scheme is something that I have been struggling with for a long time. Care to shed the secrets on yours? Vinci76: A full sculpt is out of my reach right now. Maybe in another few years. A man has to know his limits, but I am getting braver and trying my hand at more and more sculpting of limbs and such. Hephesto: I should have pics of Pedro tomorrow if I can finish paiting him today. HOT Panda: Thanks. My Client wanted him to look "Raven Guard" and not like the Telion model so I thought a head swap would work best. The skin is easy... base with a cool, light grey. Add an Ogryn Flesh wash, go back with the base color and "highlight". Sometimes I'll add Devlan Mud to the really deep recesses like the eyes and mouth area. If you really want to push the highlights, you can add a second highlight too, but the grey, wash, grey is all there is to it really. Love the skin tone for this simple conversion! Very nice, Ron! I like the muted paint-style. It's really unique, and this guy looks like he's ready to do business for a Scout trooper. Kudos man!